Although you can't power the TV, radio or your PC with this Electrical Outlet Hidden DVR Camera…you will capture any activity that happens! Although you can't power the TV, radio or your PC with this Electrical Outlet Hidden DVR Camera…you can set it up to pretend you are. When you aren't home, these appliances don't need to be on anyway! If you experience a break in, and come home to missing valuables, this hidden camera will catch that burglar. You can give the recorded video right to the police, and have proof for your insurance company. Plugging the electrical outlet into a wall plug powers the DVR and the camera. It doesn't power anything else though so if you plug something else into it, that device is only for show. This DVR Hidden Camera is contained in a wall outlet and looks innocuous in any room. Record all the activity that happens in that room and watch it later by using the included RCA cable to connect to your TV or computer OR insert the included 16GB SD card into your computer. Like a Fly on the Wall! This wall outlet hidden camera features motion-activated recording that starts as soon as motion is detected. With motion-activation, you won't have to skip forward through hours of uneventful recording. 64GB memory allows you to record up to 9 hours of continuous recording. Does NOT function as an outlet. Appliances plugged in will NOT work. 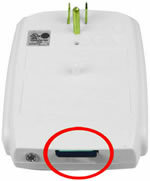 Red Circle shows where SD card is underneath the outlet.